Another video from the set of Todd Phillips' Joker has leaked online, featuring Joaquin Phoenix crying in a phonebooth while wearing clown makeup. It's pretty amazing to see so much material from the upcoming film leak online in such a quick fashion. The production has only been up and running for a few weeks, but we've already seen a wealth of set photos and video find their way online, giving DC fans a better idea of what to expect when the movie hits theaters next year. In the new set video, it looks like Joaquin Phoenix's Arthur Fleck is having a pretty bad day. He's speaking to someone while in a phonebooth, wearing clown makeup. It's not Joker makeup and is instead that of a normal clown. Whatever message he gets on the phone reduces him to tears, doubled over from the news that he just received as citizens of Gotham walk past the booth. Obviously, it's not clear what exactly is going on in the scene since we're seeing it without any context. After the scene is complete, Joaquin Phoenix is ushered off the set by handlers with a towel over his head. 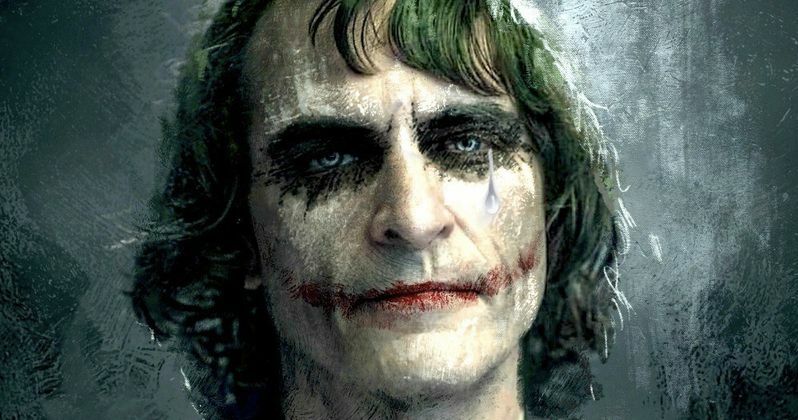 While we don't know the specific details of the scene, it has been heavily rumored that Todd Phillips is taking elements from Alan Moore's The Killing Joke for Joker, which means we could have just seen the breaking point of failing comedian Arthur Fleck's life which sends him over the edge and into criminal behavior. In the graphic novel, Fleck takes a job robbing a chemical plant, resulting in him falling into a vat of acid and turning into the Joker. Joker is a lower budget film for Warner Bros. and DC Films, which could explain why we're seeing so much leaked material from the movie end up online. With that being said, we've still yet to see anything from the set that has spoiled the story. We know that the Clown Prince of Crime and his goons will rob a church in the film and that there is a public protest against the rich, and in particular, Thomas Wayne. But other than that, everything is still a mystery. Joaquin Phoenix describes Joker as a character study, which leads one to believe that we're going to get some insight into the thinking of Arthur Fleck and the human portion of what he later becomes. The movie has been described as "gritty" and a "cautionary tale," which makes a lot of sense, especially considering that we're talking about the Joker here. But will a movie centering on the Clown Prince of Crime be able to fly without a visit from the Dark Knight when it comes time for box office earnings? That remains to be seen, but Joker has a pretty healthy buzz amongst DC fans at the moment. You can check out the latest video from the set below, thanks to the Flix Talk YouTube channel.